Here it comes folks: the holiday that kicks off what could turn into a three-month, non-stop food marathon. But you're not going to let that happen, right? There's no way to avoid it—and there's no reason you should. Yes, the annual food fest we call Thanksgiving Dinner is on its way. This one meal can send shivers of terror into the most resolute bodybuilder, but by cooking up these healthy holiday meal substitutes, you can push back from the table without breaking the legs off your chair. Here are a few ways to optimize classic recipes you're already craving, so you don't end up regretting them—but also still love eating them! This dessert dish has been masquerading as a healthy serving of vegetables for too long! The amount of sugar in candied yams is nothing short of staggering. The marshmallow topping, of course, is the main culprit. Marshmallows are straight-up whipped sugar, and if you're trying to lose weight, it has to go. Instead of dotting the dish with marshmallows, bring in the pecans! In their natural state, these nuts are sweet, buttery, and loaded with enough fiber and fat to give you the flavor you want without the insulin response you don't need. Chop them finely or leave them whole—they're delicious either way! Below the marshmallow layer hide the yams. Typically, people buy the canned ones packed in sweet syrup. Bad idea. Instead, buy some fresh yams or sweet potatoes from the produce aisle. It'll take you a little more time to prepare them, but you'll be sparing your pancreas from a holiday noogie. Even so, these tubers are mostly starch, so don't overdo them. If candied yams aren't a family favorite, don't serve them at all. You're not obligated to include any single recipe. This is something that is often overlooked. Or, if your group likes their sweets, look for other totally healthy, totally delicious ideas like pumpkin pie soft-serve. I can hear the traditionalists out there gasping. The truth is, potatoes, if eaten in moderation, are not an unhealthy food. But on top of all the other starchy holiday standbys that await you, mashers aren't going to help you keep your calories in check. Do your guests a favor and wean them off potatoes and turn them on to the surprisingly delicious and Paleo-friendly alternative, cauliflower. You can prepare cauliflower almost the same you do potatoes: chop them up, steam them, then mash away! After that, you can add in any of the other delicious ingredients that you would have added to the potatoes, such as butter, garlic, sour cream and chives, bacon, or cheese. Like potatoes, cauliflower has a mild taste. With the right condiments, your guests might not even notice the switch.Cauliflower is that good! Of course, some people just want what they want on the Thanksgiving table—health be damned. In that case, there are other ways to prepare traditional dishes that can get past the food censors and still taste great! Enough of the side dishes, what about the main course? Here are new takes on three of the more common main dishes—along with some good news. The main dish is usually the easiest part of the meal to keep healthy. It's mostly protein. Follow my suggestions for each dish, and your main course will be as healthy as it is delicious. 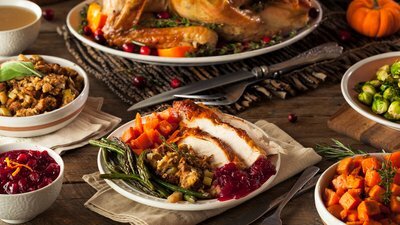 Usually, people eat more turkey on Thanksgiving than any other dish. That's fine, as long as you don't over salt it. That bloated, day-after-Thanksgiving feeling you get comes from eating too much food, period, but also from the water retention caused by eating way too much salt. Instead of going heavy on salt when you prepare the big bird, rub it down with extra herbs and spices that will give the turkey a terrific flavor. Stuffing: On a day that features wall-to-wall food, cramming a loaf of bread into your turkey is perhaps the ultimate overkill. If you feel uncomfortable putting an unstuffed bird in the oven, throw some onions, root vegetables, or cloves of garlic into the cavity. Not only will your bird taste fantastic, but you'll have spared yourself from a ton of carbs you didn't need. Gravy: A good tip is to thicken your gravy with a cauliflower puree instead of flour or cornstarch. Keep aside a bit of the mashed cauliflower you prepared and sauté it a bit to get rid of extra moisture. Nobody will notice the difference, and you will have eliminated one more source of unnecessary carbs from the table. There's nothing wrong with choosing ham instead of turkey—as long as you avoid the honey or maple glaze. You can also skip the salt completely, since ham is usually highly salted. Try one of the many rubs and spice blends available to give the ham a new taste! Let's talk some more about salt. As they do when preparing turkey or ham, some people apply salt to their rib roast the way they would to de-ice their front walk. Combine that with all the sauces jampacked with sugar, and you've gone to the health dark side. Instead of a sugared sauce, whip together some sour cream and horseradish, or cook up a quick garlic-and-herb butter to serve instead of a heavy sauce. Surprised by this one? Don't be. Lasagna shows up at more holiday potlucks than almost any other dish. And why not? It's easy to make, easy to transport, and people like it. Here are a few things you can do to make it a bit healthier. Pasta: Noodles might as well be breakfast cereal—as soon as you swallow them, your body gets to work turning them into sugar and then into fat. My advice? Replace them with sliced eggplant or zucchini. They'll absorb all the surrounding flavors, and achieve the same texture as noodles when you bake them. Sauce: If you buy premade sauce at the store, odds are it's loaded with sugar. You can look for varieties with low carbs or no added sugar but, like so many other foods you can buy premade, they're usually much healthier—and tastier—when you make them yourself. Thanksgiving is an opportunity for people to come together and maybe overdo things a bit. You don't have to run away from that. Just don't feel like you have to turn it into a mini-bulk just because everyone around you is! One way to enjoy the day is to keep your metabolism purring with a Thanksgiving-friendly workout. You can also follow a few simple practices, like not showing up for dinner starving or remembering to chew your food well. Don't be afraid to plan ahead, knowing you'll skip certain foods entirely, or eat just a tiny portion of them. Then, settle in to the table knowing you're ready for a great time that won't get in the way of your great results.